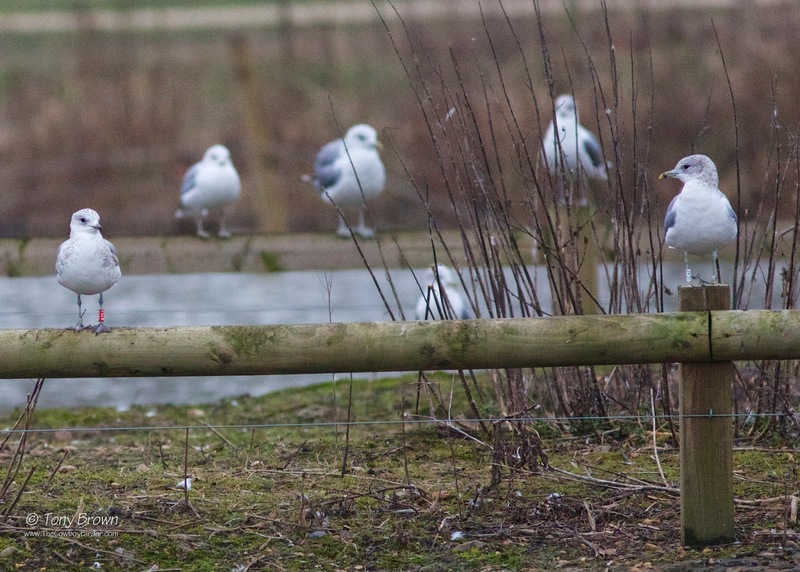 The photo below of a few Gulls milling around Jubilee Pond on Wanstead Flats is little uninspiring, that is until you look closely at both Common Gulls on the fence post. On closer inspection the left hand Gull is sporting a red ring (A25J) and the right hand bird has a white ring (JC4P) - and that's what makes a rather dull photo a lot more interesting. I still await final confirmation from cr-birding.org but after reporting both of these sightings, initial reports suggest both birds were ringed away from our shores in the UK and across the North Sea into Northern Europe. White ring (JC4P) was ringed in the region around Southern Norway, near Lista Bird Observatory, approximately 841 kilometres from Wanstead, and the red ring (A25J) was ringed in Northern Germany near Hamburg, some 692 Kilometres away - both are impressive stats, and shows the type of distance's Gulls can typically cover, but what's more impressive is to have both birds in Wanstead on the same day, standing on the same fence post, having both travelled some considerable distance to be there at the same time - now that's impressive. Once I receive all the relevant information regarding both birds history and movements, I'll up date this blogpost with the results - finding both these colour-ringed Gulls made a quiet February trip to the patch a lot more interesting than it might have been otherwise. 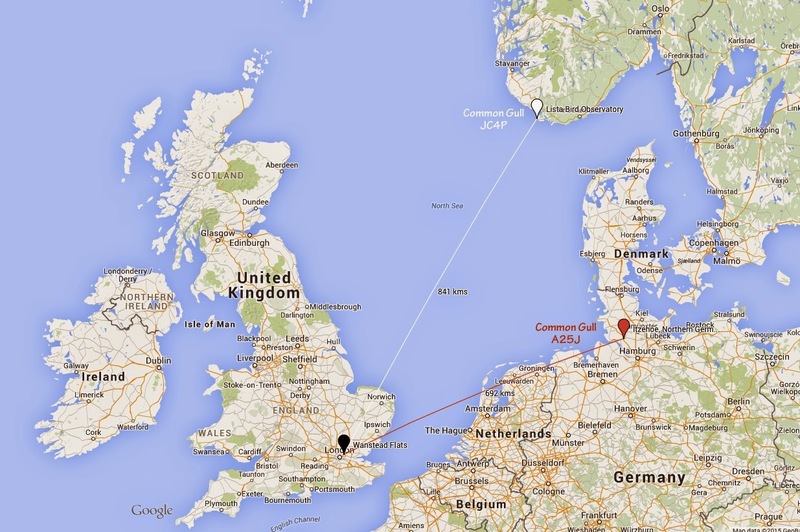 Red ring A25J was ringed as an unfledged bird on the 23rd June 2014 in Moorfleet, Hamburg. White ring JC4P was ringed on the 20th September 2012 in Time, Rogaland, Norway which is just south of Stavanger and was aged as a 1st calendar year bird.